Let’s get some new ideas on how to use basil and pesto sauce. To get the dendrons firing, here are some slightly bizarre, but exciting appetizer ideas that the Society loves. This is a variation on a recipe from the great Marcella Hazan (“The Essentials of Classic Italian Cooking”). You need to find a good source of walnut halves. Costco has them if you are willing to buy a big bag. 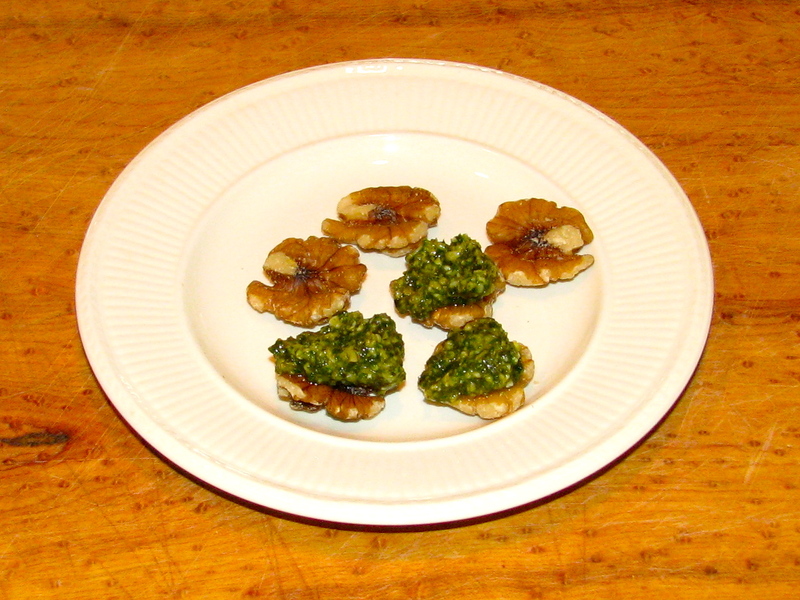 Make a batch of pesto sauce (see recipe in post called “Summer Pesto Extravaganza”). Take two tablespoons of butter and cream it into the sauce. This will make it a little thicker. Spoon a dollop of the sauce on top of the walnut halves and arrange neatly on a plate and serve with cocktails. These will be an instant success, and as you bask in the glow of murmured adoration, you will, in true Bravado fashion, tell everyone everything you know about basil. Deviled eggs are an oft-forgotten treat. They are so good and good for you (forget all of the cholesterol stuff – there is little evidence that eggs do any damage). This recipe is drop dead simple. Hard-boil a dozen eggs (you need a lot since you are a Bravado social animal and there must be a party involved). Gently peel the eggs, cut in half, remove the yolks and mix them with one batch of pesto sauce. Mash them well so you have a nice creamy mixture. Spoon into the hard-boiled “whites”, garnish with a small basil leaf and serve. This recipe is from Vivian who understands the Bravado mystique. She is sassy, struts her stuff and tells everyone how she makes things and why her cooking is so cool. She’s got the Bravado style and may be one of the first women allowed into the Society, and as soon as the U.S. balances the budget, we are going to consider having women in the Society. This is not for the economically faint of heart. You need a very good, very aged Balsamic vinegar and they are costly. (We will do a post on that later.) You also need a very good fresh mozzarella, preferably a true buffalo mozzarella (yes, Mr. Bravado fan, it is made with milk from water buffalo, which is much richer and creamier than products from cow’s milk). Unfortunately, buffalo mozzarella is not cheap. (Belgioso, an American manufacturer, makes a very good cow’s milk mozzarella, which is more reasonable in price – usually available at Costco). Pick two-dozen of the largest leaves on your basil plant. Rinse and dry with a paper towel. Slice the mozzarella as thinly as humanly possible and put a slice on each leaf. Drizzle a few drops – not many – on top of the mozzarella and serve. The taste will surprise you and your guests.